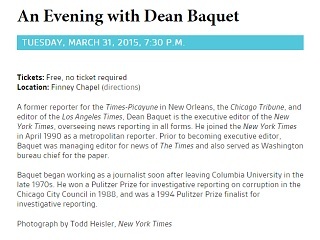 Long before the term "native ad," Baquet wrestled with something called "Pure South." In the 1960s and ‘70s, newspapers did that kind of stuff. And then a bunch of us, including me, rose up and said, “We shouldn’t be doing this,” and then we stopped. Newspapers have always struggled with this, and I think we’re more pure — and I intend to keep it that way — now than we ever have been. Elsewhere in his answer, Baquet made a couple of forceful points about his changed feelings regarding a phenomenon that has returned to the daily newspaper newsroom and is likely here to stay.